There are two kinds of teases. The first is the method by which we mock or ridicule someone’s shortcomings and flaws. Sometimes it’s done out of love and friendship; a playful reminder that we do know these people in ways that others do not. But sometimes it’s also done out of maliciousness and spite. Like the way President Donald Trump does on Twitter and at his ego-gratifying rallies against those that he hates. Even I’m not immune to that habit, as evidenced in the many ways that I refer to people like Trump on my column and through social media. But there is another kind of tease, and that is the kind that is more notorious and more prevalent. It doesn’t mock you, at least not directly. It plays on our desires and our dreams. It is often something that we can never have, but it tells us that we can have it... or at least have a taste of it. Every day, I start my day with teases. My social media feed is full of beautiful women who tease me with beautiful locations and alluring poses and exciting lifestyles. They make the most boring things in the world exciting simply by seeing them do it. Of course, they don’t really do the truly boring things such as shopping for groceries or doing laundry, but they will be out in nightclubs and concerts. They’ll be at pricy restaurants and show off the cuisine, or they’ll be at the cheapest places in the world that serve vegan food. They’ll visit museums and lay around on beaches and take pictures of their toes in front of the sand and the surf. They’ll share pictures of themselves working out. Or they’ll take bubble baths and show the faucet and their painted toes and the bath bomb they just dropped in. They’ll playfully show their smiling faces in the morning to say what a beautiful day it is, and here is their favorite dog or cat curled up with them. But it is all just that... a tease. A promise of something that they know they can never truly deliver for you and they know that you will never truly have. You will never truly have that kind of beautiful company in your life. You will never truly share that kind of life with them. Here is what will happen if you do see them in person: if it is at a resort, they will welcome you, they will spend maybe five or ten minutes with you, and then they will wish you well as you go find something else to do for the rest of your time there. If it’s at a convention, they’ll wonder if you want to purchase some photo or video, or they’ll give you a handout for some service and a price list and wonder if you want to make a sale. Because the hard reality of this tease is that it is all done for sales. They want you at that resort so that the resort can make money. They want you at that convention to bring in sales. They don’t want you. They want the sales. It’s all about money to them. It’s not about sharing their lives with you or bringing you into their lives. It’s all about making money by teasing something that you want but they know that you will never have. And the scary part is that even when some of us realize this, we will still be suckered in. Because we still have that dream, that desire that can never be fulfilled. And, because it is not fulfilled and can never be fulfilled, we will still come back for more. 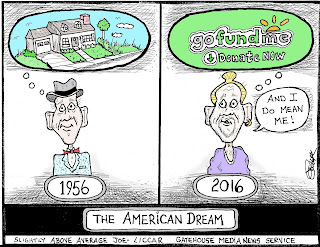 I have come to the realization that what we used to call the “American Dream” is really now just the “American Tease”. It is something that is hyped up, propped up, and sold to us continually... but also something that we will never truly have... ever. The “American Dream” was sold to us as something we all can attain. Study, graduate, get a job, get a car, work hard, get married, get a house, have a family, raise your kids to become parents themselves, then retire and live out your sunset years in peace and harmony. I grew up being told this dream could be mine. We all were taught this. This is what is sold to us on TV and movies. Politicians and media personalities swear by it. They all promise to protect it or preserve it or to restore it. But what they don’t do is promise to see it delivered. Education is key, right? That’s what is promised will get us those better-paying jobs. So we’re told to study and go back for more education and sign up for more education and take more and more courses. Go online. Go to night school. Sacrifice our personal time to get that education. But that education is not free. It costs money. So we are convinced to get student loans. And then we find out that the education we just took out loans for does not guarantee a better-paying job. So we have to work harder and take on a second or third job to pay for that loan for the education that was supposed to get us that better-paying job that never materialized. Buy a car. Get some autonomy in your life. Can’t afford one? Well there are loans you can take out. Even for used cars. Even if your credit is crap, you can get a loan. It just will mean you have to work harder still and longer to pay that off as well. On top of the loans for that education that promised your better-paying jobs that never materialized. Having a house is important, right? Everyone wants to us to buy one. Or two. Or a whole bunch of them and flip them for profit. That seems to be the fun game that is on the cable channels. But at least have one. Can’t afford one? Oh there are plenty of institutions that will lend us the money. Hell, we can do it through our cellphones now. Download their app, fill in the blanks, and they’ll get us set up with a mortgage. Bad credit? No credit? No problem. That just means that we’ll have to work even harder and work more jobs to pay for that loan on top of the car loan and the student loan for that better-paying job that never materialized. But, wait, I’m not done. Let’s talk about that job that you are working hard at. Or two of them. Or three of them. How’s the pay? Not so good, is it? Well according to the Pew Research Center, real wages have not increased at all for most Americans since 1974. Adjusted for inflation, that same job worked in 1974 is being paid the same as it does in 2018. Even with increases in the minimum wage and the tax cuts given to the corporations and businesses and upper-level people, the rest of us have been paid the same for forty years. Forty years! No wonder you’re having to work two or three jobs! Because even though real waves have stagnated for four decades, the cost of everything keeps going up. Those mortgages and loans go up. The cost of living goes up. Healthcare is going up. Education is going up. It costs more and more and more to keep your kids educated even through public schools. And that presumes that you get to keep your job. Because even if Trump didn’t start imposing tariffs and start a trade war, businesses are padding their profit margins by cutting your benefits and even cutting your positions. For all the talk of immigration, nobody’s saying anything about the continued run of H1 visas going to people coming into America who have more education than you and will work cheaper than you. So you’re struggling to make ends meet. Are you able to enjoy that home? Take pleasure in driving that car? Watch your kids grow up? Spend time with your spouse? How’s your retirement plan? Is there one? Is there one that does not involve the words “Lotto” or “Lottery” or “Sweepstakes”? Well if you’re struggling, then there’s “help” as well. Take a cruise! They have payment plans. Get a credit card! You can buy the things you need online with a credit card. Can’t afford the shiny new medication on TV? There are services that help! It just will cost a little more and you’ll just have to work even harder still. 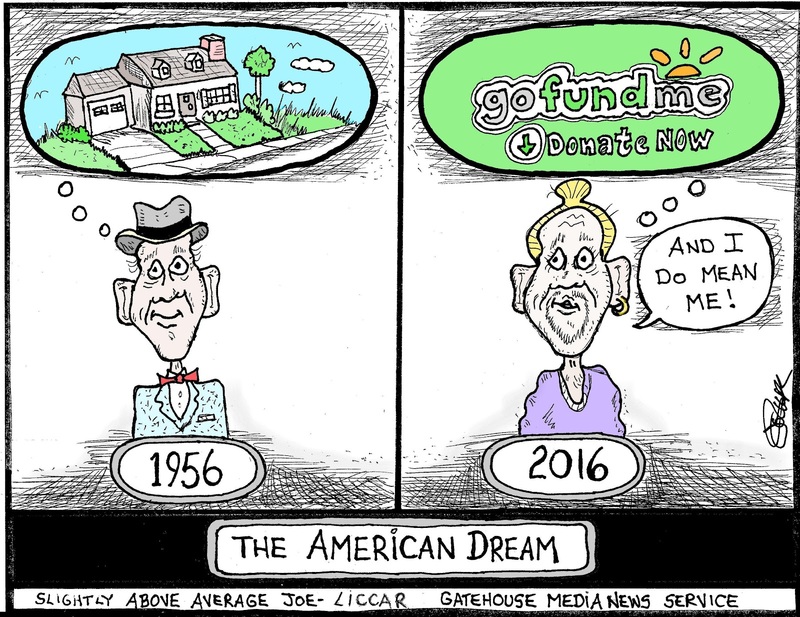 Let’s get brutally honest here... there is no such thing as the “American Dream” anymore for most Americans. It’s all just a tease. It’s just an endless parade of sales pitches and payment plans and loans on top of loans. Much like the beautiful ladies that want you to buy that energy drink or go to that convention or go to that resort, the “dream” that is being pitched in the media and by politicians is just a sales pitch. It’s all about getting us all on the hook for more and more money. And forget getting help from the two dominant political parties in America. They’re not there for us or for the “dream” we think we’re trying to get, because it is not our dream to begin with. It’s just the sales pitch of corporations and banks. They own that “dream”. They control who gets the privilege of “having” that “dream”, and, unless you’re part of that elite few, that list will never include you. For the rest of us, all we get are bills. And loans. And payment plans. The first step to overcoming a tease is recognizing that you will never get what you want or need from them. When it comes to the “American Tease”, more and more of us need to start accepting that we will never get those things that we were sold on. They’re nice to look at. Wonderful to fantasize about. But if we can’t afford them, then we have to give up the idea we can have them, and we need to stop listening to the people and corporations that try to sell it to us.